Jay Hewitt is 41 years old and has lived with type 1 diabetes since 1991. 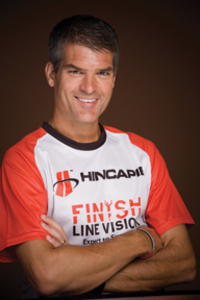 He is an elite Ironman triathlete (2.4 mile swim, 112 mile bike ride, 26.2 mile run) and three-time member of the U.S. National Team for Long Course Triathlon. He is a lawyer, the father of a 16-month-old daughter, and a motivational speaker. He speaks to people with diabetes and others all over the world on fitness, nutrition, and achieving goals in life and business. Jay is also captain of Team Joslin at the Joslin Diabetes Center in Boston, MA. Visit Jay’s website at www.jayhewitt.com. I was diagnosed with type 1 relatively late in life, at age 24. People sometimes remark to me, with genuine kindness, that it must have been harder on me. Perhaps they think I recall what it was like to be a “normal” child and young adult, to do and eat what I wanted without insulin, checking blood sugar, or worrying about highs and lows or long-term complications. I appreciate their sincerity, but I always correct them. Diabetesis not harder for me. It is hard on everyone. Whether you were diagnosed as a child or an adult, it complicates your life and the lives of your family. Nevertheless, children with diabetes and your families, you are my true inspiration. I meet and speak to thousands of you every year through my racing and motivational speaking around the U.S. You inspire me much more than I could ever inspire you. Trying to understand the changing world as a six-year-old child is hard enough. But having to check your blood sugar, inject insulin, and understand nutrition and exercise, when none of the other kids in school knows or cares what acarbohydrate is-Now that is impressive! You are a role model for other kids. They may never admit it, but they look up to you. It is impressive that you keep going, keep playing, and keep taking care of all the things you must, things that they never have to think about. I have a two-year-old daughter. If she hurts, I hurt, and I will do anything to prevent it. Just keeping up with the normal child items, diapers, clothes, bottles, and food is a challenge. But parents who must approach their child multiple times a day with a syringe or make sure that an insulin pump stays on, who keep up with the meters and strips, who bring extra supplies and nutrition even for that quick errand, and who wonder in the middle of the night if their child is going low or high-they have to handle a whole other level of parenting. I am a big fan of diabetes camps. Each summer I am honored to spend time at Camp Joslin for boys (www.joslin.org), and the neighboring Camp Clara Barton for girls (www.bartoncenter.org) in Massachusetts. What fantastic places for a child with diabetes. Kids can be kids, play sports and activities, eat, learn, and make friends with other kids with diabetes, all under the 24-hour watchful eyes of doctors, nurses, and counselors from the world-renowned Joslin Diabetes Center and other medical centers in Boston. These kids get to feel that they finally fit in. They gain confidence that they can play sports, do anything, even be an Ironman triathlete, because they see others with diabetes doing it by controlling their diabetes in the right way. I’ve seen the nervous faces of parents dropping their child off, and their amazed faces when they pick them up days later. “This is not the same child,” they say. Each year at Camp Joslin I host a real swim-run biathlon, sponsored last year by the makers of the Omnipod insulin pump. Last year a six-year-old camper named Josh participated, a boy who had never imagined that he could swim, or run, or do anything like that. He was nervous. But on race day I watched him swim a quarter mile right next to me, then run a mile and cross the finish line to the cheers and roar of the crowd and his fellow campers. His life, and my life, was changed that day. Another fantastic organization is Children with Diabetes (CWD) (www.childrenwithdiabetes.com), an online community for organizing events and sharing information and support for kids with diabetes and their parents. Each year, the makers of OneTouch glucose meters sponsor my appearance at CWD’s Friends for Life conference. Last year 3,000 parents, kids with diabetes, and their brothers and sisters met in Orlando to make friends, attend theme parks, hear great speakers and doctors, and learn about the latest diabetes products and best practices. It is a great deal and wonderful atmosphere for kids to be kids and the whole family to relax, have fun, learn, and be inspired. I’ll be there again this year from July 7th to 12th at Disney’s Coronado Springs Resort, and I would love to see you there. Racing the Ironman with diabetes can be hard, and some days in a long workout or race I start to wonder if I can keep going. But I think about the kids with diabetes who may be watching me, and their parents who do so much to take care of them, and I am inspired. Thank you, kids and parents, for inspiring me. You are my heroes.